If my KFEG membership year is March to March, and say I buy a business class ticket in January, will the $25k requirement reset in March, or do I have a whole year from January to qualify for PPS? ie spending $25k in J/F. Is the PPS membership year the same as the KFEG year? Or is it a rolling 12 months? I think PPS year is tracked separately from Elite year. There are two tracker meters (one for Elite and one for PPS) in your Account Summary page usually. In your case, it should be Jan to Jan (rolling). To be sure, you should give them a call. If I recall correctly, the PPS value is tracked on a rolling basis. Meaning, if you buy a J class tix in Jan, then the value of this ticket will last until Jan the following year. So if you are aiming for PPS, it is important to take note of when the values of the various J/F class tickets expire. However, once you hit PPS, (I think) they start counting your 1 year PPS membership from that particular month. For the first PPS qualification it is rolling 12 month. After you achieve the first time PPS it will be fixed to 12 month from the month you qualified. Perhaps this was implied in the above, but just to clarify: your PPS value is tracked by the date of the actual flight, not when you buy the ticket. Your KF year will be reset when you hit PPS (or TPP for that matter). So say I fly in J for first time in Jan, and reach $25k spend by August, then my PPS year becomes Aug to Aug, the following year? Assuming of course I fly all the required J flights by August. What happens to the KFEG membership year going from Mar-Mar? Does it become redundant? 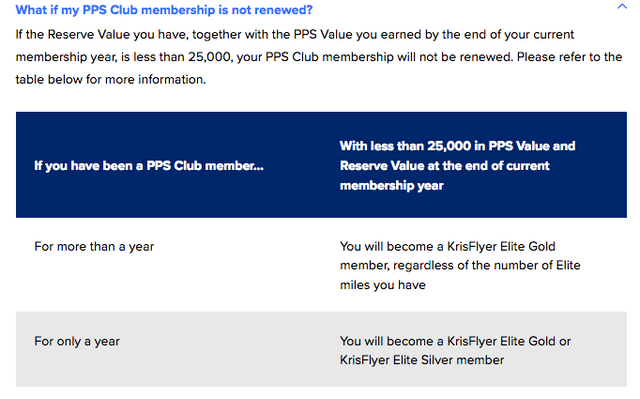 Yes your pps kicks in once u achieve 25k pps$ so in your scenario Aug to Aug.
Once you reach PPS, you get a e-mail notifying you of the current KF miles changes and PPS value etc. At the bottom, you will also see a line showing you the number of elite miles you accumulated based on your PPS membership year. You can use that as a gauge if you want. There was a post in 2008 on what happened to your status if you do not retain your PPS membership. Not sure if things have changed 10 years on, but it does seem that you can even drop to KFES if you do not have the required elite miles clocked. Hmm there’s no soft landing from PPS to KFEG? Wow! I’m better off keeping KFEG each year and spending the $ on one world and getting QF Gold. Does SQ KF ever have status match programme for other alliance? How about other FFP offering status match to KF in Singapore? Seldom hear anything to this end in Singapore, while there are plenty in US, Australia.. Thanks for the confirmation. It’s always better to have it in writing.